Don’t just snack till you’re sick. Try real meals — and I’m not talking about deep-fried chicken and wings. 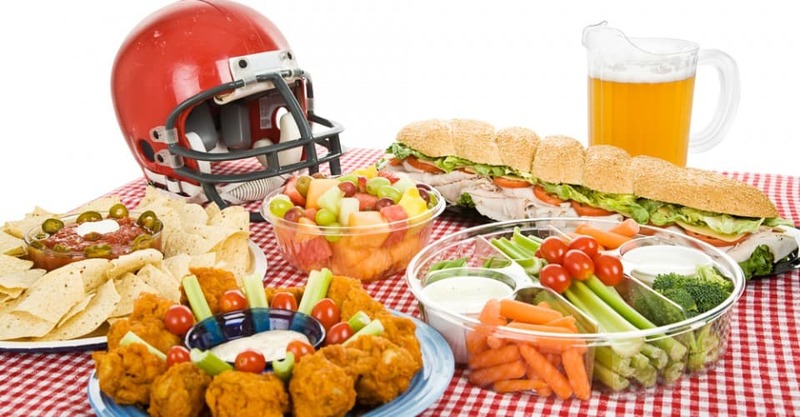 Since the Super Bowl is played during dinnertime, eat a healthy dinner. Go to the supermarket and pick up a roasted chicken. Or how about sliced white-meat turkey with low-fat cheese and mustard on 100 percent whole-grain bread? If you must order pizza, at least have it as a meal, and try cheeseless thin crust with plenty of veggies — broccoli, spinach, tomatoes, zucchini, mushrooms or even artichoke hearts — on top. Avoid personal pan and stuffed-crust pizza: The thick, oily crust equals added fat and #calories. Don’t feel like cooking a real meal? Try giving your guests their own portion-controlled servings of Lean Cuisine, Amy’s Kitchen, Healthy Choice, Kashi or Smart Ones by Weight Watchers — they’re all in the frozen-#food section, and there are some great choices. Dr. Barbara Rolls of Penn State University has completed a great deal of research showing how low-calorie soups can help you fend off hunger and provide nutritious, tasty meals. There are many great-tasting low-calorie soups made by Campbell’s, Healthy Choice, Amy’s Kitchen and Progresso — just watch out for the sodium, and keep the calories under 100 per cup. There are plenty of cereals that are 100 percent whole grain without added sugar, and many with less than 120 calories per cup. Put out bowls of Kashi or Cheerios. You can also make your own popcorn in a hot-air popper. Or if, like me, you don’t love air-popped corn and don’t mind the hassle (or the occasional burned kernel), pop yours on the stove top the old-fashioned way. I’m still a huge fan of pan-cooked popcorn. Put the kernels in a deep pot, coat them with Pam or cooking spray, cover and pop. Open the lid slightly from time to time to release the steam. Just be careful not to burn yourself. And shake the pot throughout the process — the shaking spreads the heat and allows the unpopped corn to pop. Then top with a margarine spray, salt and pepper. There are many kinds of salsa, and most are very low in calories — about 15 for 2 tablespoons. Or try bruschetta topping, which is primarily tomatoes and olive oil, and serve it with whole-wheat crackers instead of Italian bread. Guacamole is another good choice. Made with avocados, it’s packed with antioxidants, vitamins B6, C and E, as well as folate and potassium and is a great source of monounsaturated fat. Hummus, a popular Middle Eastern spread made from chickpeas, tahini (ground sesame seeds), roasted garlic and olive oil, has 25-35 calories per tablespoon (1/2 ounce) but contains a tremendous amount of fiber and protein. Healthy Recipe by: Charles Platkin, PhD., founder of DietDetective.com. Nutritional information: (1 tablespoon) 34.2 calories, 1.3g fat, 4.5g carbs, 1g fiber, 1.5g protein. Mash the avocados, add remaining ingredients and mix with a fork. Nutritional information: (1 tablespoon) 24 calories, 2g fat, 1.5g carbs, 1g fiber, 0.3g protein. The biggest problem with all these dips is the company they keep — namely crackers and chips. Your best bet is to pick 100 percent whole-grain crackers with very few ingredients and no added sugar. We like Dr. Krackers (www.drkracker.com/) and Mr. Krispers (mrkrispers.elsstore.com), but there are other 100 percent whole-grain crackers. You can also make your own pita chips: Cut whole-grain pita bread into quarters, separate the tops from the bottoms and toast. If you really want potato or pita chips from the store, go with Stacy’s or another baked chip, but keep in mind that every chip you eat has 12 to 14 calories — and they add up. You can easily make the wings yourself. Remove the skin (it saves lots of calories), soak them in hot sauce or roll them in egg whites, dip them in bread crumbs and bake them in the oven. Skip the blue cheese dressing, which has about 305 calories in 4 tablespoons. Dip them in hot sauce instead. Crush potato crisps completely and mix them with cereal crumbs in a small dish. Add a dash of each of the seasonings and mix well. In a separate bowl, toss chicken pieces with hot sauce. Spray a baking pan with nonstick spray. Shake off excess sauce from chicken pieces, coat with crumb mixture, and place in the baking pan. Bake in preheated oven for 10 minutes. Turn and bake 10 more minutes, or until crispy and cooked through. Nutritional information: (per serving) 175 calories, 1.5g fat, 1,153mg sodium*, 14g carbs, 4g fiber, 27g protein. *Note: Although nutritional information reflects the full amount of RedHot called for in the ingredients list, you will not use the entire amount to coat the chicken. So the actual sodium count will likely be much lower. Halve the jalapenos lengthwise, and remove the seeds, stems and membranes. (Be very careful when handling jalapenos; wash hands frequently and well, and avoid touching your face and eyes.) Wash halves and dry them very well; set aside. In a bowl, combine cream cheese and cheddar cheese. If desired, season with salt, pepper and/or garlic powder. Using a blender, grind Fiber One to a bread-crumb-like consistency. If you like, season crumbs with salt, pepper and/or garlic powder. Place Fiber One crumbs in one small dish and Egg Beaters in another. Stuff each pepper half with cheese mixture, then dip both sides in Egg Beaters and coat with crumbs. Place peppers on a baking pan sprayed with nonstick spray, and bake in preheated oven for 25 minutes (for very spicy poppers) to 30 minutes (medium-hot poppers). They are good munch foods. Peeling the hard-boiled eggs keeps you occupied, and one egg has only 75 calories along with 6 grams of protein. As far as the olives go, four jumbo olives have about 30 calories, and they’re a good source of monounsaturated (“good”) fats and vitamin E.
I realize people frown upon nuts because they are high in calories, but if you’re able to limit yourself to a few, they are very satisfying and extremely healthful from a cardiovascular perspective. Some have high amounts of monounsaturated fat, useful for regulating blood lipids and protecting against cardiovascular deterioration. Plus, they pack loads of energy and protein. Put them out in half-ounce portions, not big bowls. Check out almonds, pistachios, pecans, cashews and walnuts, to name just a few. But watch out, because they’re still loaded with calories. Here’s the cost if you overindulge: almonds, 3 ounces (72 nuts), 480 calories, 45g fat, 18g carbs, 18g protein; cashews, 3 ounces (60 nuts), 510 calories, 42g fat, 24g carbs, 15g protein; walnuts, 3 ounces (42 halves), 540 calories, 51g fat, 15g, carbs, 12g protein; pistachios, shelled, 3 ounces (141 nuts), 510 calories, 45g fat, 6g carbs, 12g protein; pecans, 3 ounces (60 halves), 570 calories, 60g fat, 15g carbohydrates, 9g protein. Planning on having a few bottles? Your best bet is to go for tasty Beck’s Light at only 64 calories per 12-ounce bottle — that’s a real bargain. If you’re not a Beck’s Light fan, try sampling a few very light beers before the game to see which ones you prefer. Healthy Recipe by: Charles Stuart Platkin, M.P.H., founder of DietDetective.com and author of The #Diet Detective’s Calorie Bargain Bible (Simon & Schuster/Fireside, 2007). Healthy Recipe by: Charles Stuart Platkin, M.P.H., founder of DietDetective.com and author of The Diet Detective’s Calorie Bargain Bible (Simon & Schuster/Fireside, 2007). Crush potato crisps completely and, in a small dish, mix with cereal crumbs. Add a dash of each of the seasonings and mix well. Bake in preheated oven for 10 minutes. Turn and bake10 more minutes, or until crispy and cooked through. Nutritional information: (per serving) 175 calories, 1.5g fat, 1,153mg* sodium, 14g carbs, 4g fiber, 27g protein.